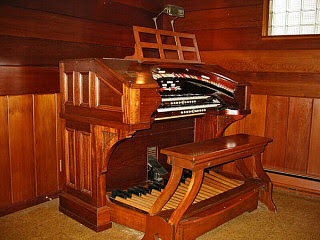 John Ignatowski recently contributed an article on the pipe organs that have been donated to the Soo Theatre and plans for the future installation. Check it out! In July 1895, Mark Twain embarked on a world tour. On this tour was one very notable stop – the Grand Opera House in Sault Ste. Marie, Michigan. 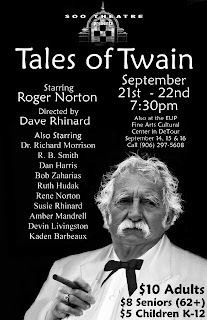 Over one hundred years later, Twain's unique style will return to the Soo on September 21 and 22 at 7:30 p.m. This time the wit and wisdom of Samuel Clemens will be personified by Roger Norton as he narrates Tales of Twain at Soo Theatre. 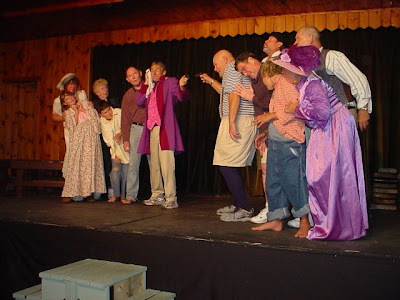 Supporting Norton's incredible impersonation of Twain is an all-star cast of actors who will be performing vignettes from some well known, and not-so-well known, stories and speeches. It is documented that on Twain's visit to the Soo, "a woman in the audience suffered a heart attack, brought on, perhaps, from convulsive laughing." You will be laughing convulsively too, as the nothing-is-sacred style of Twain pokes fun at politics, America, and human behavior. Tickets can be purchased at the Soo Theatre office or at the door and are only $10 for adults, $8 for seniors, and $5 for children. Mark September 21 and 22 on your calendars now. Or, should I say Mark Twain them?